1st Place Best of Parade - Crosslake Veterinary Hostpital! Your paper mach'e float was fabulous! 2nd Place - Lake Country Crafts & Cones - How many Leprechauns can one float hold??? 3rd Place Wes Hanson - Lucky Charms? Our favorite! Best Non-Profit - The Babinski Foundation - Beacause the're a pot of gold at the end of every rainbow. Most Enthusiastic - Listen to WJJY's Ken & Tess morning show Monday morning to learn the winner! Complete listing of raffle prize winners listed here. 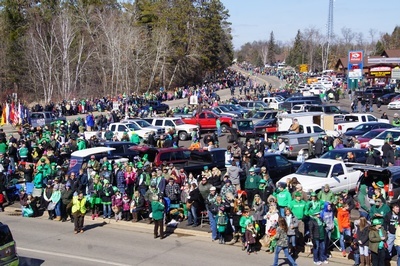 You don't have to be Irish to appreciate all the excitement associated with this decades-long tradition voted Best St. Patrick's Day Celebration in the State of Minnesota! Dust off the lawn chairs, get your Irish face on and load up the whole family as this 45 year celebration insures fun for all ages! Gather your family and friends and Chase the Lucky Leprechaun to find the Pot O' Gold. Register for The 6th Annual Clover Dash 5K which takes place on Saturday, March 16. The race begins and ends in Crosslake's Town Square, so after the race you're in the perfect spot for pre-parade entertainment and more! Purchase a $6 Raffle Ticket and get a free Blinkie Button! Raffle Tickets/Blinkies are available at Crosslake Chamber member businesses. Get Blinkie Button deals (Fri. & Sat. March 15-16), and join us the following weekend (Friday, March 22) at Andy's Bar & Grill for the Raffle Ticket Drawing Party! Your ticket could win you one of many terrific prize packages. Raffle ticket holders need not be present to win, but we'll have great door prizes for lucky attendees too! One single clue will be released at 3 p.m. to start the chase to find the Lucky Leprechauns who hold the progressive clues! 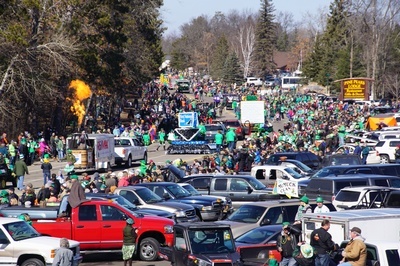 Awards presented at 10:30 a.m.
Park & Ride free shuttle transportation from the Crosslake Log Church (37218 CR 66) to parade lineup in Crosslake Town Square (35770 Allen Ave). Drop off all your float riders/walkers in the Town Square parade lineup area. One vehicle driver can then proceed to The Log Church to take the shuttle back to meet your group. Games, face painting, food, book walk, prizes and fun! Chamber Bucks awarded to top 3 for-business entries and top 1 non-profit organization entry. Parade judges are located in the Better Living Concepts Sunhome in Town Square - Show 'em what you've got! Parade begins at 2 p.m.
Purchase a $6 Raffle Ticket and get a 2019 Blinkie Button free! Passages of Time - Free hot dog with $5 min. purchase, while they last!